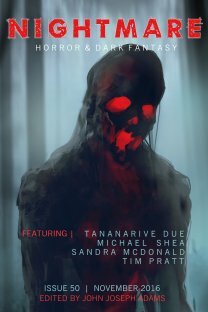 The stories of this issue of Nightmare Magazine explore the uncertain boundaries of horror and the mundane. The violence and the darkness lurking under the most basic of actions. These stories look at characters lost in their own battles and maybe in their own heads but struggling against the role they play in suffering and death, or maybe just not willing to see how far they've fallen, how much the darkness has reached through them, and how much they might like it. These are difficult stories and with a touch of unreliability to them, as if the realities they describe might not be quite solid, quite certain. It's a nice paired set of stories and I'm going to get to those reviews! Well…okay then. That…happened. This is an incredibly creepy story about possession and about violence. About family and about the past catching up with you. Jaz, the main character, is a woman who has delt with urges her entire life and has mostly kept them under control. Mostly, except that she's never really been able to avoid doing harm. Wanting to hurt people. There is a great question for me in the story of what's really going on, of how much Jaz is in control and how much she is the victim of deeper currents, pulled along by some force compelling her to violence. She's supposed to have been cleansed of this taint, cured by a grandmother who performed rituals over her. And yet in some ways it seems like she learned to hide it. Maybe even from herself, her urges manifesting in the way she's used people and hurt people but always in a way that she was able to deny, to push away acknowledging. And the story becomes of the slow dawning realization that something is wrong, unavoidably wrong, and that it might be too late. It's a gripping read, violent and rather shocking because of how well Jaz struggles with herself, the way that she seems possessed and out of control and unable to own her actions and the way that she revels in them, wants them. It gives two different pictures of the same person and it's hard to tell exactly where the one ends and the other begins, worming doubt into the narrative that Jaz tells herself. Whatever is happening, it is creepy and wrenching to see Jaz act, to hear the thoughts and urges that course through her, to witness her remorse and her lack of remorse. It's a difficult story and one that definitely finds the horror of the situation, the chilling cold of the final lines and the implications of what might be to come. A great read! This is another story that does a nice job with a slightly unreliable narrator. Or, perhaps more as I read it, an unreliable reality. The story centers on a main character, a former soldier, who is employed by the Old Ones, who is part of something deep and dark and nightmarish, who is in many ways forced to work for the Old Ones because he has no other options, because he came back from war damaged and there was no help for him, Because he can't work a normal job and his wife is overworking herself while pregnant to try and get them by. And the pressure of that and the way it feeds into itself creates a sort of unwinnable situation. And I like the way the story layers itself, at one level about this man and his struggle with these Lovecraftian Old Ones and on another level about his struggle with the system. With the Old One of toxic masculinity that makes him unwilling to really reach out and ask for help, to be honest, to be vulnerable. With the Old One of corruption that means he can't receive proper care after his service. With the Old One of poverty that keeps him unable to find security, that makes him have to risk himself in very questionable actions in the hope of getting enough money to get by, all the while being exploited not because he is special but because he is vulnerable. It's a dark story that looks at helplessness and the lurking evils of the world in a very interesting way, mixing existential horror with a more bureaucratic one. It's an effective piece with a sinking voice mired in desperation and pain. It's a difficult read without an awful lot of hope to offer, but that makes it a rather sharp bit of horror. A fine story!